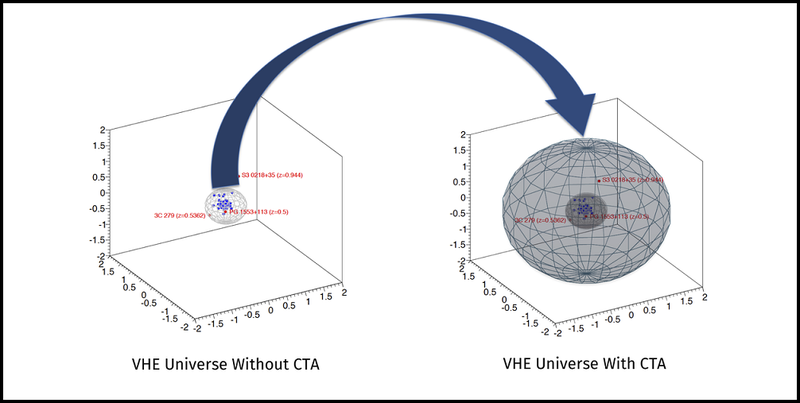 When we talk about Cherenkov Telescope Array (CTA), we usually talk about studying the Universe at the highest energies. 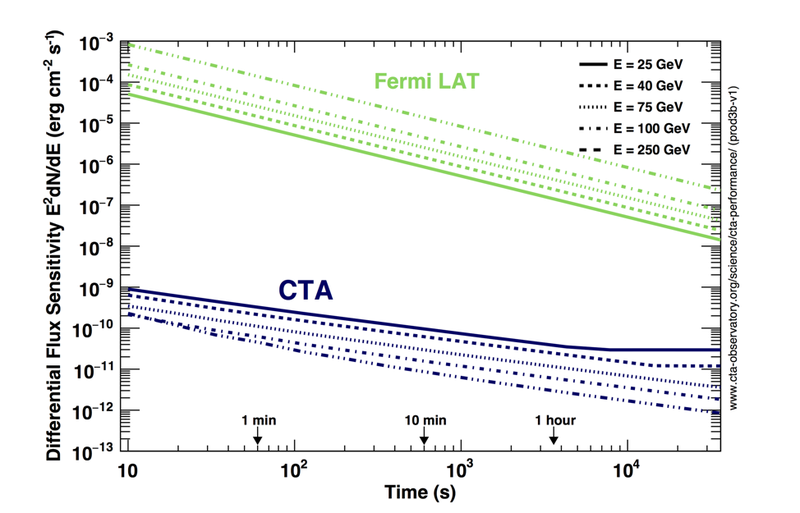 Scientists, however, also talk about low energies with CTA, which seems strange because those “low” energies are still a million times higher than the energy of X-rays. Therefore, it’s all a matter of perspective. 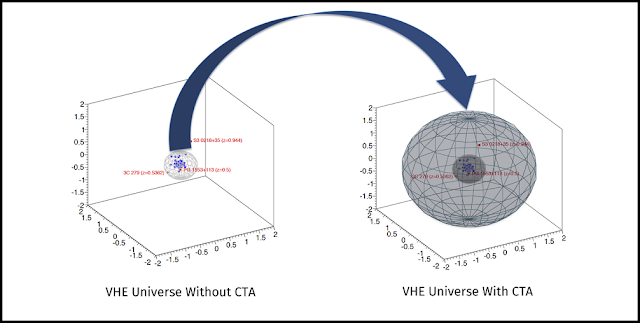 The low energies from CTA’s perspective are those on the low edge (20 GeV to around 200 GeV) of its full energy range between 20 GeV and 300 TeV. Why are these low energies important and what do scientists hope to discover through their study? This is an overview of why scientists are scrambling to push for excellent sensitivity of CTA in this lower-energy band. The main physics case comes from the fact that the Universe is not entirely transparent to gamma rays because of the pair production between the gamma rays and the low-energy (this time really low, in the range of infrared and optical) photons of the background light, which has been filling the Universe since the first stars were created. This absorption is, however, energy dependent. So, if we can measure sources up to a few hundreds of million parsecs (which we call the nearby Universe!) with 1 TeV gamma rays, we can reach distances 10 times further with 100 GeV gamma rays, and at 20 GeV the Universe is transparent down to its origins (i.e. close to the Big Bang). This is why when CTA extends the sensitivity to lower gamma-ray energies, it increases the observable volume significantly, which is illustrated schematically in the image above. Through a larger accessible volume, we do not only increase fundamentally the number of sources and phenomena we can study, but, as is the case in all other wavelengths, we are also able to look into the past by measuring gamma rays that were produced billions of years before reaching the Earth. How were gamma rays produced in the past? Are gamma-ray sources in the distant Universe the same as close by? Are there new unseen phenomena? These are just a few of the questions that have convinced scientists to construct CTA’s Large-Sized Telescopes (LSTs), which will be devoted to the study of low-energy gamma rays. The LST prototype, LST-1, was recently inaugurated on CTA’s north site on the island of La Palma, Spain. CTA will not be the only instrument sensitive to low-energy gamma rays. Gamma-ray satellites like Fermi-LAT, for example, also can measure in this energy regime. However, because satellites have a small collection area (<1m2), they struggle to measure transient phenomena. CTA’s collection area will be about a million times larger, which results in a much-improved sensitivity on short timescales where the hadronic background is unimportant. Image below demonstrates that for every short-time phenomena (like a flare) with a duration of less than a day, CTA’s sensitivity is many orders of magnitude better than the satellite-based Fermi-LAT. This is extremely important as we expect many time-variable phenomena like flares of extragalactic sources (e.g. blazars and radio galaxies), as well as galactic transients (e.g. gamma-ray binaries and soft gamma-ray repeaters) to happen on time scales of hours and below. CTA will be opening a new window in the time domain for these gamma-ray energies. Gamma-ray bursts (GRBs) are one of the clear targets for CTA in the low-energy gamma-ray regime. These bursts release most of their energy in the MeV domain and typically last only for 0.1-1000s, and their origin has been a matter of debate for several decades. The most prominent explanation is that the short GRBs (with a typical prompt emission of less than a few seconds) are mergers of black holes or neutron stars, whereas long GRBs (with a typical prompt emission of several tens of seconds) have their origin in asymmetric explosions of hypernovae. However, as of now, no GRB has been detected by CTA precursors like H.E.S.S., MAGIC or VERITAS. With CTA, its lower energy threshold and the ability of the LSTs to rotate within 20s to any point in the sky following a GRB alert, scientists hope to finally measure GRB signals on many occasions and shed light on the processes responsible for these mysteriously short but enormously luminous explosions.